Camden Catholic’s Kate Spadaro (second from right) waits to be introduced before the Lenape game on Feb. 15. The Camden Catholic girls' basketball team's biggest supporter sits nearly on the very edge of her seat during games. She cheers the loudest. She's tireless. And when players feel their energy fading, they look to the end of their bench where Kate Spadaro is an endless source of inspiration. Everybody knows Spadaro wears her emotions on her sleeve. That's what made Feb. 15 so special. Spadaro, who has Down syndrome, has been the Irish's manager for the past four years. And last week as a tribute to her on Senior Night, Spadaro was in uniform against Lenape. Not only was she announced as a starter, she was out there for the opening tipoff and, after a couple of tries, sank the first basket as cheers rained down on her. The pregame ceremony put a big, bright smile on Spadaro's face. But the shot going through the net brought a rush of uncontrollable tears. She had to sit down, her face buried in her hands. "Just to be out there was so awesome — it was so much fun," Spadaro said as that smile came back, saying more than more than words ever could. "Being a part of Camden Catholic, where everyone is always just so nice to me and I have so many friends is really something special." When Kate Deutsch, the Irish's leading scorer, sees Spadaro in the halls at school, Spadaro usually rushes Deutsch and wraps her in a big hug. "I call her Kate the Great," Deutsch said. "We share the same name. But I always tell her she's definitely the better Kate." For Deutsch, also a senior, last Thursday was a chance to return a favor — to say thanks to someone who has given her so much. "She is literally the light of our team, if we need a pick-me-up, we look at Kate, she's always clapping, always cheering for us," Deutsch said. "So it was just awesome to be there for her on that night because she has always been there for us." This week, after hearing about Spadaro's love of the game and her team, the Harlem Globetrotters reached out to Camden Catholic and offered the girls complimentary tickets for two Globetrotters performances at the Wells Fargo Center on March 4. The team said it would "commend the girls for showing compassion, one of the key elements of the Globetrotters' national bullying prevention program." 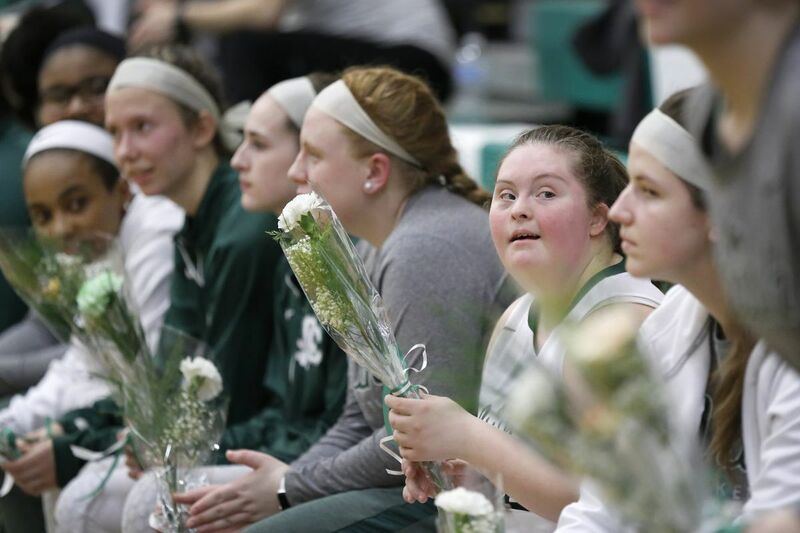 Outside of basketball, Spadaro is also the manager for the girls' lacrosse team, and as a testament to how much she really means to the Camden Catholic community, she was named homecoming queen last fall. Camden Catholic coach Chris Palladino is Spadaro's sociology teacher. Spadaro thrives in the classroom through the school's McAuley Program, for students with special needs. "She's probably one of the most organized students I've ever had — she's in the National Honor Society," Palladino said. "She works hard, she's very focused. She's just such a great person. And we're lucky to have her in our program." One of the things that surprises people most about Spadaro — outside of her incredible, boundless positivity and energy — is her basketball skill and acumen. She has played the sport most of her life. And Palladino said she'll often chime in to help when players make mistakes. And it's not uncommon to see Spadaro working on her stroke and sinking shots before games. Spadaro said she loves the game. She loves her school and her coaches and her teammates. "That's why it meant so much to me to be in that game," she said. "Plus, it's just so much fun to be out there."